Ouiska Run Farm came to us with a previously designed logo that they loved and hoped would be integrated into their future label design. Thus, we worked closely with the client to establish a rich visual system in which the logo could thrive and maintain prominence. Through careful manipulation of found public-domain images and vintage botanical illustrations, we composed rich tapestries out of the ORF honey labels, each complete with its own color palette, unique scene, and story, closely related to the honey inside. Additional details and pieces created for the ORF honey package include blind embossed circle lid labels and custom-cut hangtags featuring bronze foil accents and thermographic (raised ink) printing. The labels are hand-stamped by the client to highlight varietal locations and processing dates, which adds an extra nod to the authenticity and purity behind this client’s every motivation. 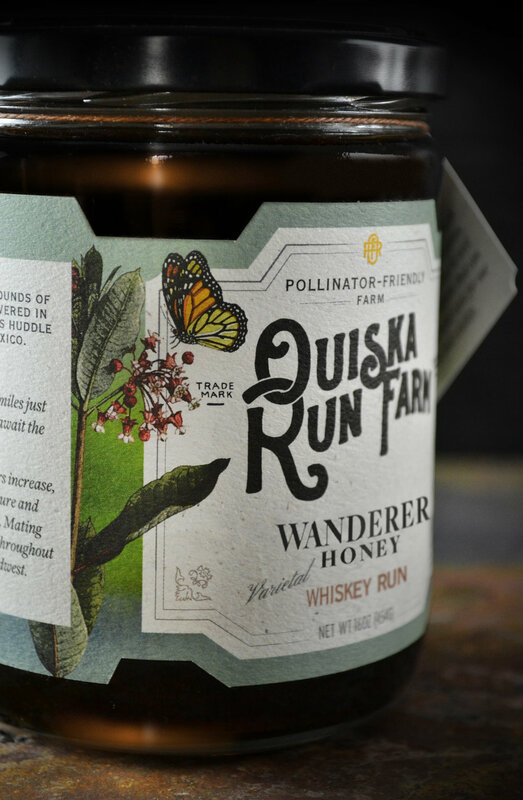 Ouiska Run Farm Honey packaging features ornate, custom-shaped labels and hangtags that beautifully support its Victorian era, vintage-styled botanical illustrations. Additionally, the client affixes a small metal bee charm to each hangtag for an extra special, personal touch. What’s with all the monarchs? At Ouiska Run Farm, pollinator conservation is at the heart of everything we do. When pollinators like butterflies and bees thrive, the environment thrives, and so too does humankind. Our artisanal honey is 100% raw and unprocessed.We strain it minimally before jarring, which resultsin rich and complex flavors. Harvested seasonally, each varietal of Ouiska Run Farm honey has its own unique blend of tasting notes, compliments of our hardworking ladies of the hive. By September, when milkweed plants have started to die back, monarchs begin their autumn migration to Mexico. The increased logging of their winteringgrounds has resulted in a loss of habitat forthe migrating butterflies. In addition, the widespread planting of genetically modified crops, increased use of neonicotinoids, erratic weather patterns, and shifts in climate are all key factors that have been implicated as causesof the monarchs decline in recent years. By purchasing this jar of Ouiska Run Farm honey, you will help to aid in pollination conservation efforts. Your contribution will assist with things such as implementing monarch way-stations, establishing pollinator gardens, as well as small scale land acquisitions that can be restored to their natural state for our native plants and wildlife.